If you're reading this then I'm going to assume that you're into sewing. And therefore you'll already be acutely aware that, these days, sewing clothes is almost always more expensive than buying them from a shop. 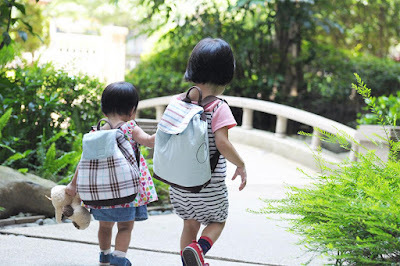 However, there are a number of ways that us sewers/sewists can keep the costs down (I've written about this here and here), and today I want to focus more on saving money on sewing patterns, specifically for children. 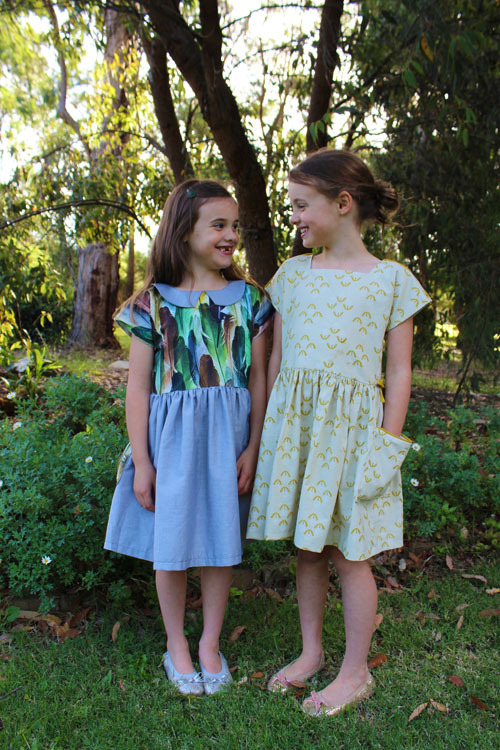 Thanks to the generosity of many sewing pattern designers, it is entirely possible to create most of a fantastic child's wardrobe (or simply some lovely additions), just using free patterns. This is not intended as an exhaustive list of free patterns, mind. These are patterns that appeal to me: that I've already tried or intend to try. Plus, I'll freely admit that I'm writing this post as a resource for myself as much as for anyone else! 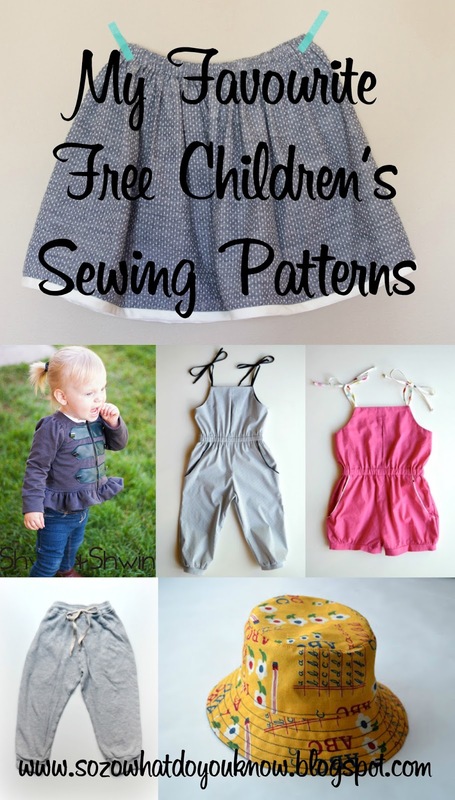 If there are any other free babies' or children's sewing patterns that you like, please do mention them in the comments section of this post. 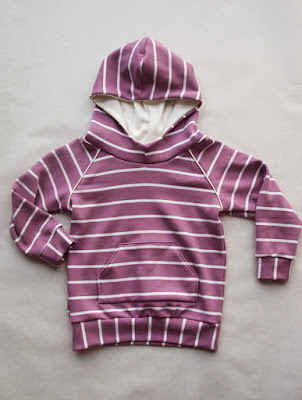 I really enjoyed making the hoodie pictured above, and seeing my then-much-smaller little girl wearing it. I used some lovely, soft interlock which worked a treat. I'm already planning one for Frankie for when he gets a bit bigger. I'm not sure a hoodie is suitable for a baby who has yet to grow much of a neck! 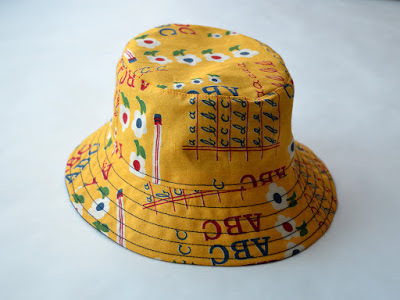 This lovely unisex pattern could be made in endless combinations of patterned and solid knits. This cute jacket/cardigan pattern is made from ponte de roma knit, and you could go to town with the embellishment or leave it plain. I think the biggest challenge would be finding an open ended zip that short! This simple, long-sleeved T-shirt pattern is billed as a pattern for girls, but I personally think this top would be equally suitable for boys if they're into slimmer fitting knit tops. 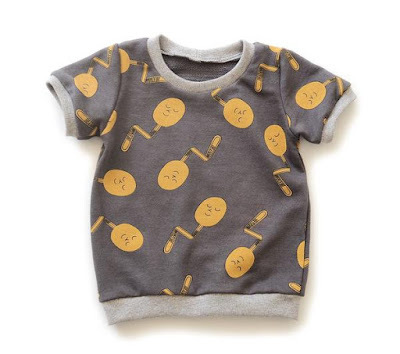 This could be a great option for making sleep wear tops as well. Ok, I've convinced myself; I'm making this for sleep wear whenever one of my kids next needs some. This pattern is easily downloadable, no sign ups needed, but the site does require you to navigate round A LOT of adverts. 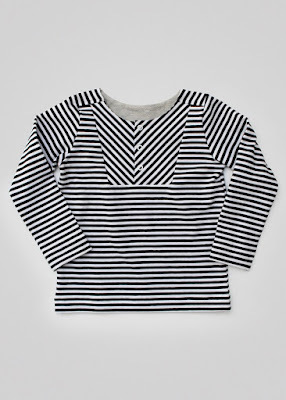 This would be a great pattern for reusing old adult T-shirts, plus it includes a long-sleeved version for cooler weather. I've just downloaded this to make as sleepwear. This simple, fastening-free knit cardigan could be easily adapted to your requirements and/or customised for more personality. I'd like to make this with patch pockets, plus lengthen and taper the sleeves to the wrists. Watch out though: you may get a headache or want to throw your laptop across the room because of all the ads that are plastered all over this website. 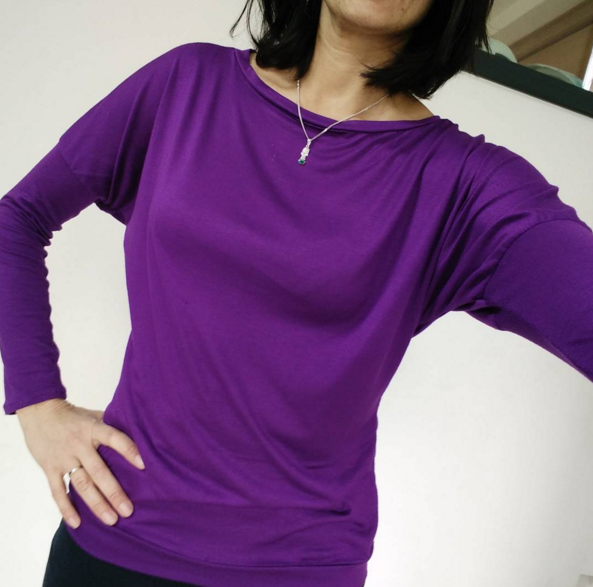 The tie-front detail, dolman sleeves and relaxed fit make this a really lovely pattern that would look fabulous in drapier single jerseys. I think this could be a real winner with early- and pre-teens, but then what do I know?! 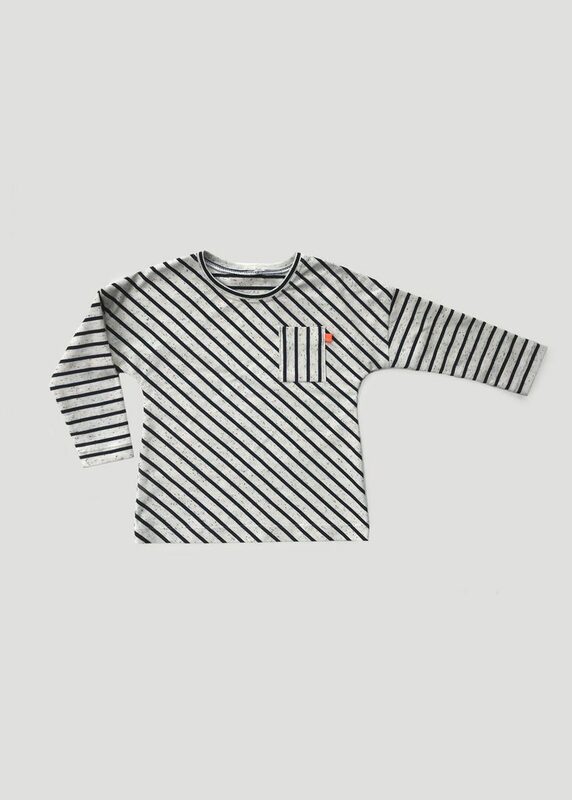 The Rowan tee is an over-sized, boxy, unisex-style T-shirt with two sleeve variations and optional patch pocket that is designed for knit fabrics. 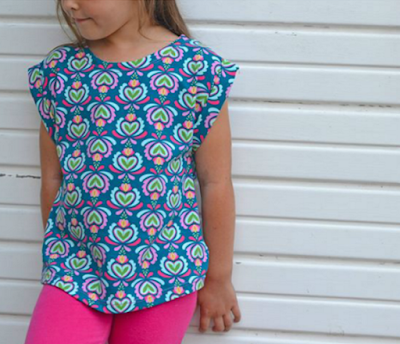 There are some super cute versions of this top pattern out there on the interwebs. I love the curved hem and folded sleeve details, and it could be lengthed into a dress pattern. You will need to be a member of Craftsy to access this pattern. This beautiful summer blouse pattern is one of the five free patterns on offer from the gorgeous French sewing pattern company, Ikatee, when you sign up to their mailing list. This site has a few fantastic free patterns that are designed to be upcycled from unwanted garments. 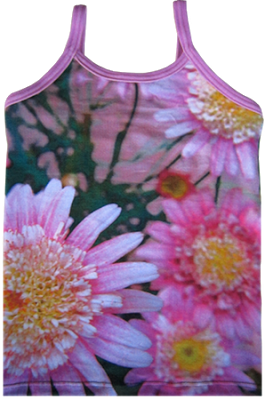 This is another lovely top design on the same site. This swing tee pattern has been graded out to a size 16 years, which seems mighty generous. It's flared at the hips with a slight high-low hem and could be a great pattern to use up small lengths of drape-y knits. I'd love to make this with different fabrics for the front and back. 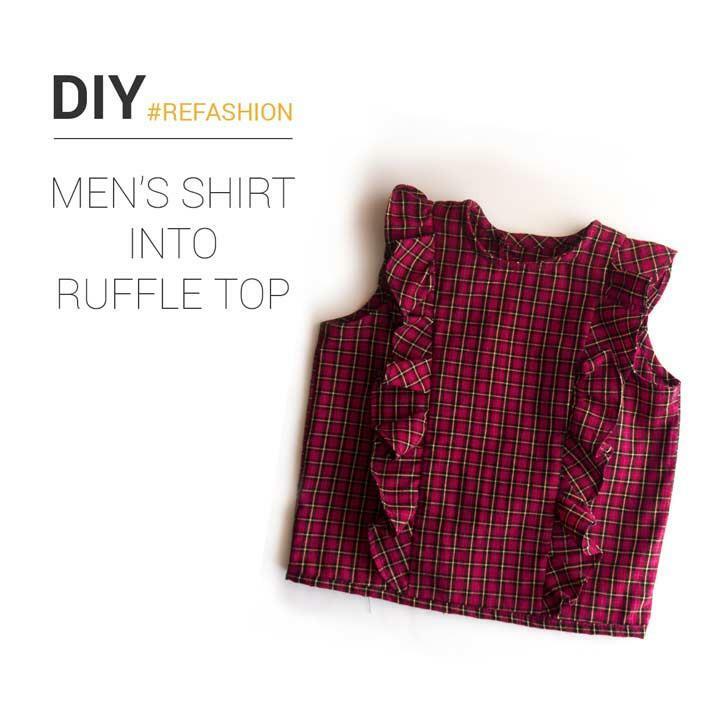 This top pattern lends itself to using up scraps by mixing different fabrics for the yoke and skirt parts, plus could be lengthened into a dress. Update: this pattern now costs $1. 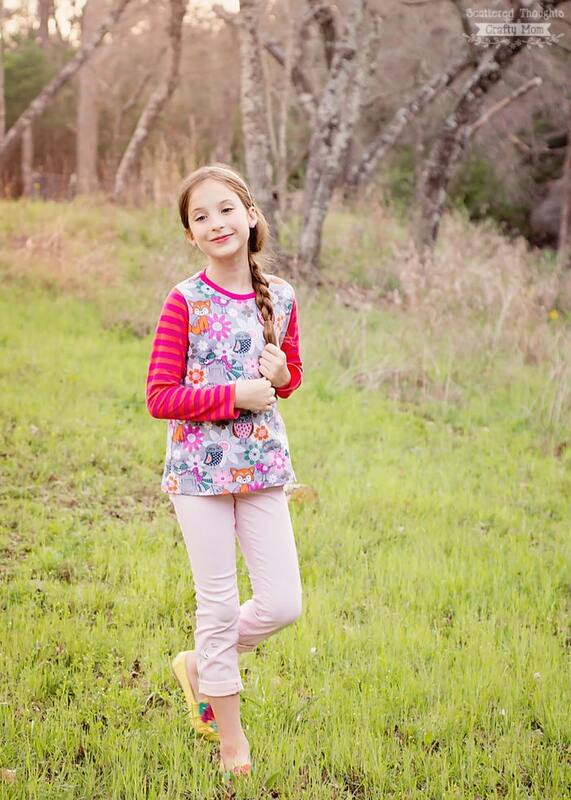 Most free sewing patterns tend to be more suited to warmer weather, so it's a real treat to find one that can make winter clothes. You can keep your baby or toddler warm with these cute, gusseted trousers that are designed to be lined in snuggly jersey. 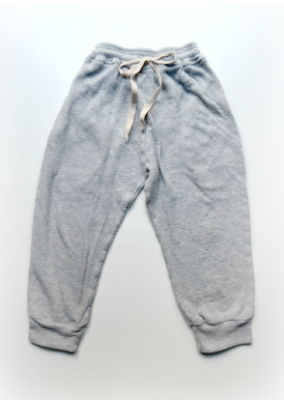 These classic knit sweatpants appear really comfy, IMO. 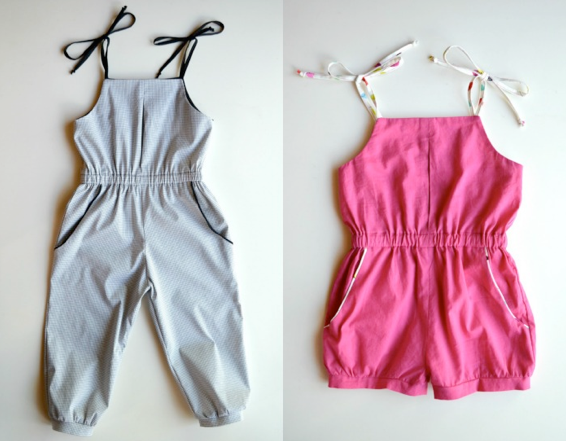 Perfect for lounging around or more sporty activities. Another of the five free patterns on offer from Ikatee when you sign up to their mailing list. I'm seriously struggling to decide which to pick! I've made countless pairs of these basic leggings now, often lengthening them to the ankle. I really can't recommend the fit of these enough. The size 2 also has two rise options, depending if the child is still in nappies or not, which is a thoughtful thing to include. Please note: you will need to be a member of Craftsy to access this pattern. I think that Rae is such an excellent designer, and being able to sample her work for free is a real treat. 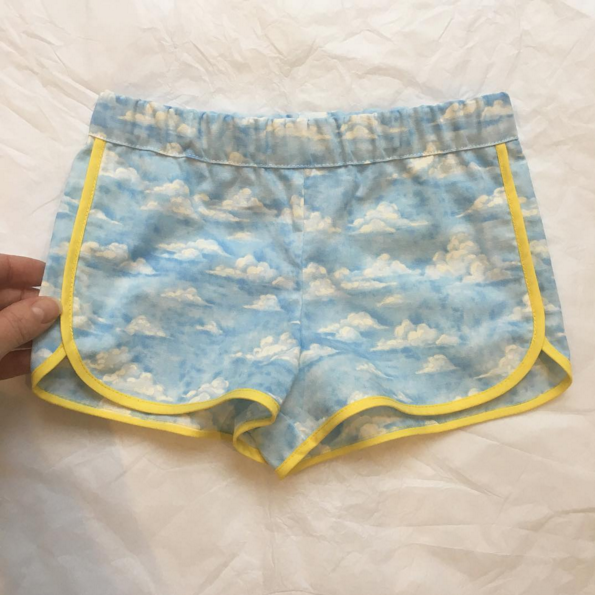 It can be hard to find fun baby tights, and even harder to find any that you might want to put a boy in (the benefit being that they feet stay covered, unlike with socks which so often come off). I reckon this could be a super useful pattern which could easily be made from the leftovers from other projects or from unwanted adult garments. 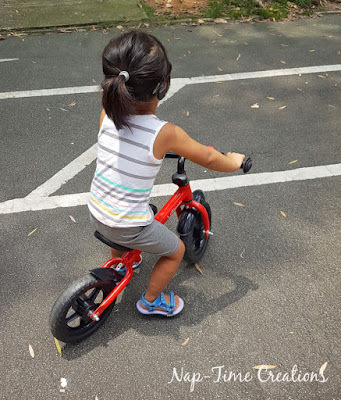 I really recommend that you click through to see some of the clever variations of shorts and trousers that are possible with this versatile, unisex pattern. 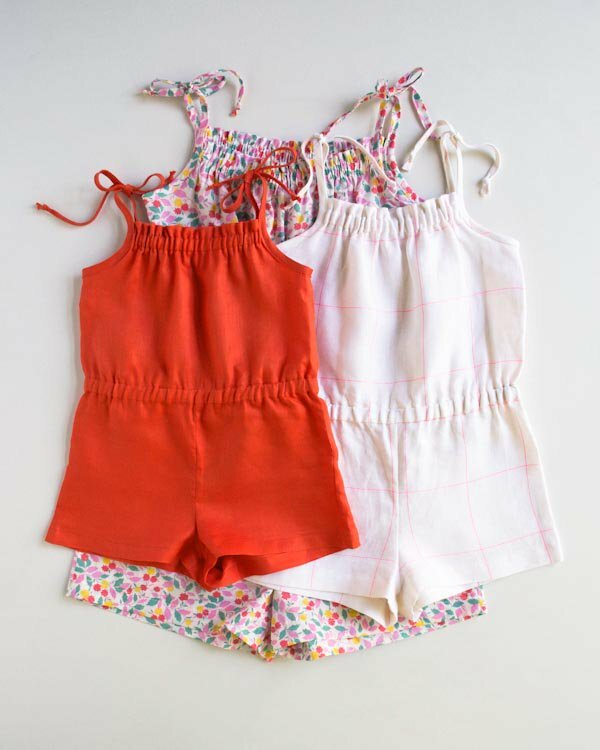 You could also go to town mixing and matching fabrics, which could be a really fun way to use up scraps from previous sewing projects. You will need to join their Facebook group to access this pattern. I had forgotten all about this pattern until my amazingly talented friend Emily made the utterly perfect pair pictured above. I'll have to wait until Dolores is out of her phase of exclusively wearing dresses, then I will make a million pairs! 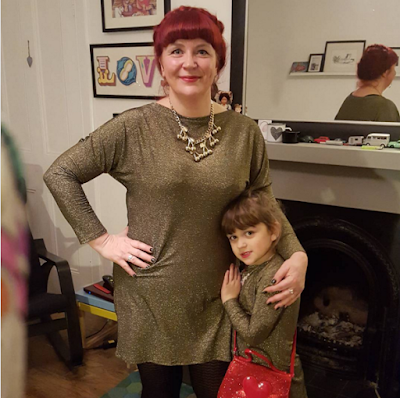 Check out this incredible festive pair pictured above! 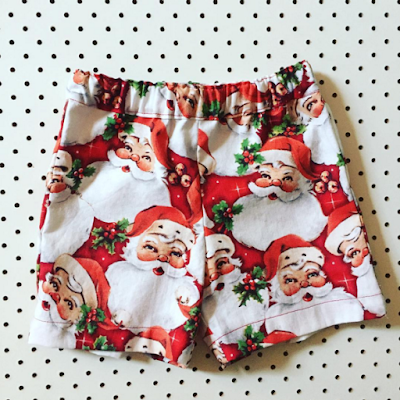 It immediately makes you start to think about what small pieces of awesome fabric you own to make into these shorts, doesn't it?! 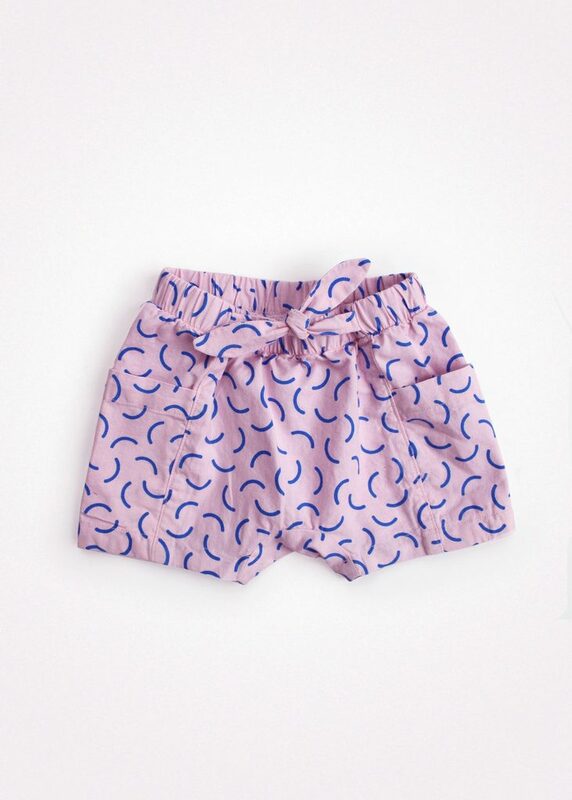 I think this is a wonderful basic shorts pattern, however I know I'm not alone in finding that it comes up a bit small, so you might want to opt for a size larger than you'd usually pick. 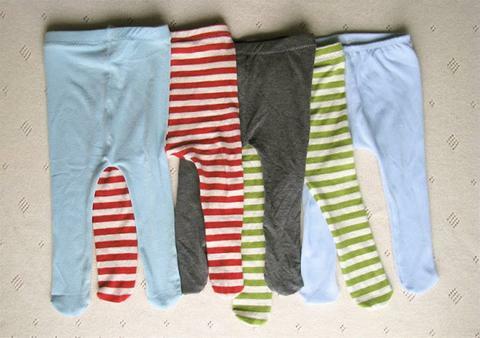 These also could be lengthened to make trousers or pyjama bottoms. Fun patch pockets on the front or the bum would make great additions too. 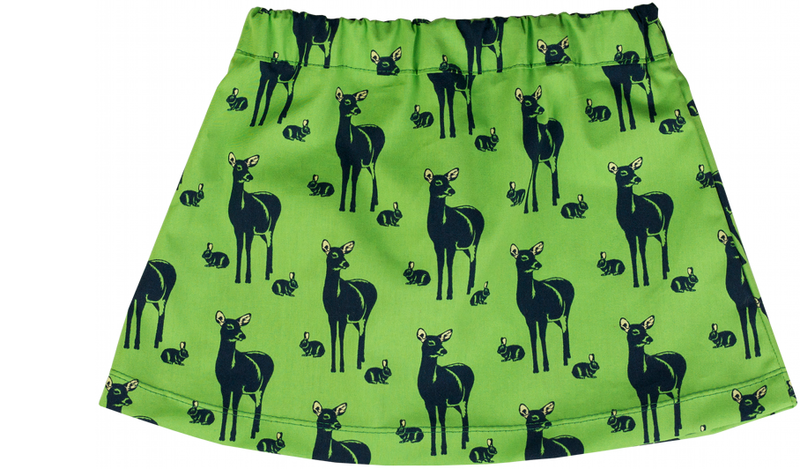 This pattern looks like a fantastic, unisex, modern take on the traditional nappy cover. I'm about to test whether or not these bummies can stop my little boy from whipping off his nappy when it's too hot for him to wear clothes! 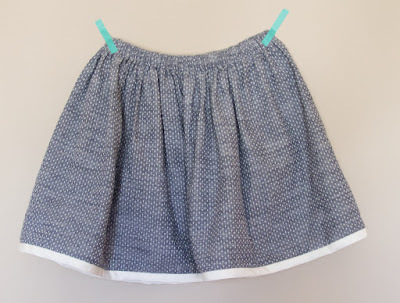 There are probably about 20,000 basic gathered skirt tutorials out there, but Oliver + S instructions are always excellent so I'd be inclined to try this one. I like the little addition of the ribbon around the hem. This would be a great project to give as a gift; no non-sewer would realise how quick and simple it was to make! If you're looking for a simple A-line knit skirt then stop the clock. Pretty knit scraps, prepare to get used. 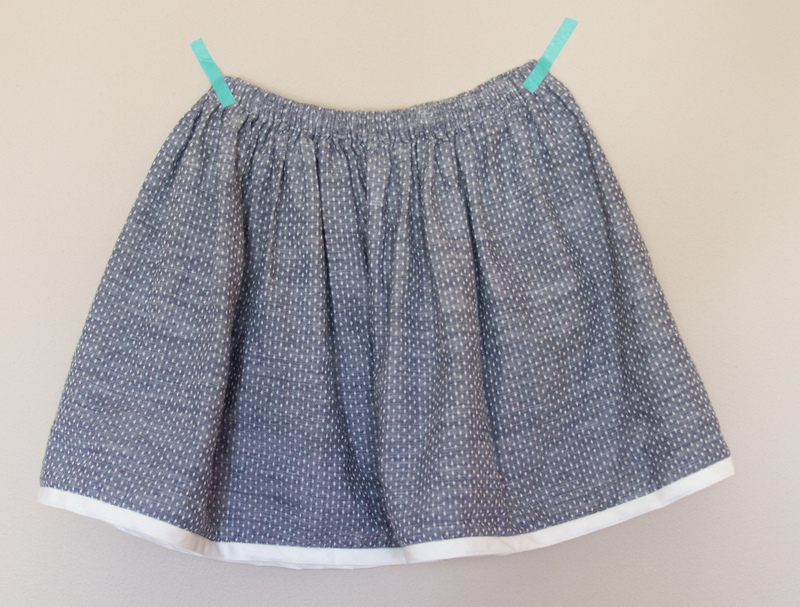 Either of these skirt patterns would be great for making quick birthday presents. 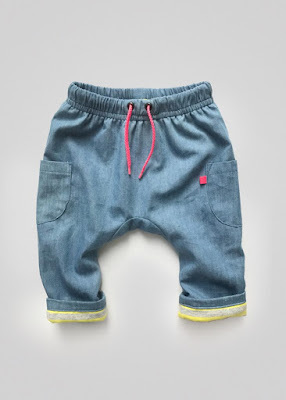 It'd make sense holding off making this until the child you are making it for can tell you that they need to wee more than four seconds before it starts to happen. The same point above applies here! 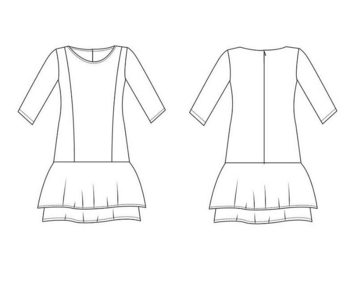 You could add a simple rectangle shape skirt piece to the bottom instead to make this pattern into a dress. This bodice-and-full-skirt dress has a relaxed style and a number of optional design details (square or round neck, pockets, collar, side ties, turn-back sleeve cuffs). I plan to try making this pattern in gingham as school dress for Dolores to wear in warmer months. 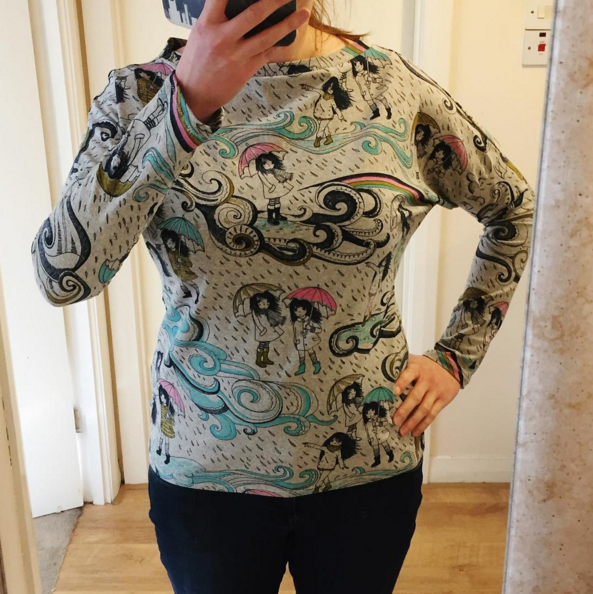 Please note: you need to sign up to the Sewpony newsletter to access this pattern. The 'Made by Oranges' design team are the people behind My Image, B*Inspired and B-Trendy pattern magazines, and they've made a number of their patterns available in PDF form also. This spec drawing may not look super inspiring, but the modelled images that you can see here look really sweet. 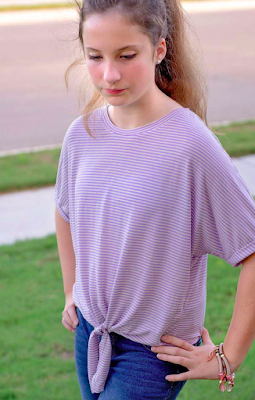 Plus a dress pattern with long sleeves can be a rare and valuable thing, depending on the climate where you live of course. 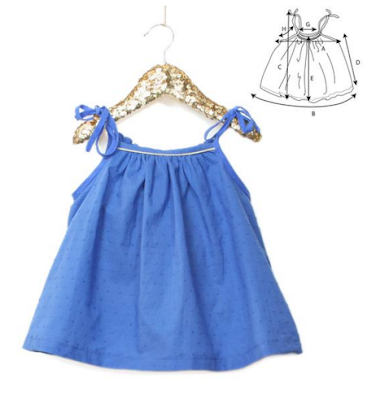 It's like a mini April Rhodes's Staple dress! 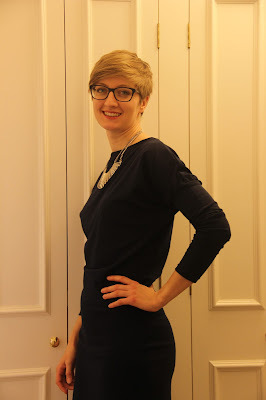 This simple knit dress is definitely a project that you could make the evening before setting off on holiday. They've also given instructions to modify this pattern into a raglan sleeved version for something a bit fancier. 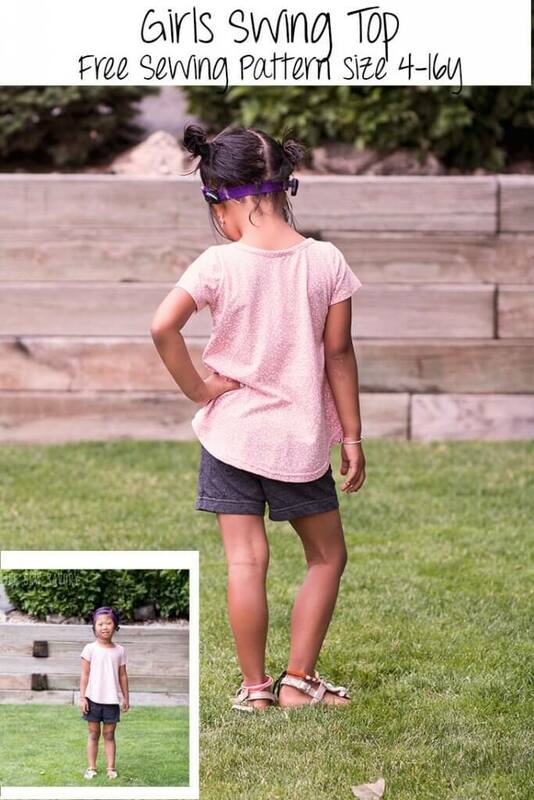 My daughter has a several hand-me-down dresses like this which are soooo useful in the summer. 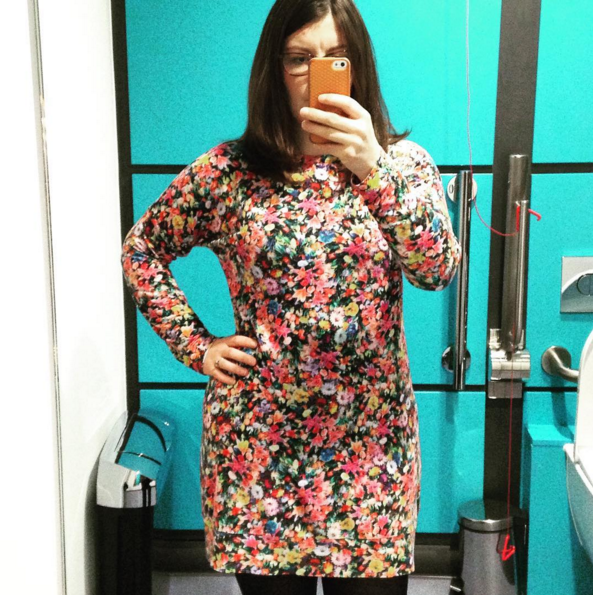 They are the perfect holiday garment if you're going somewhere warm because knit dresses don't need ironing. Fact. 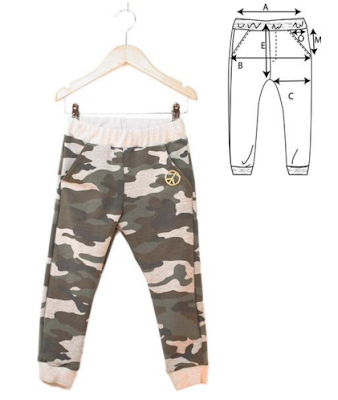 For pyjamas, I reckon you could combine the Brindille & Twig Ringer tee pattern with the Oliver + S sunny day shorts (which could be made in knit and/or lengthened into trousers) or the Ikatee Barcelona or Jim jogpants (made in jersey or interlock, perhaps omitting the pockets). 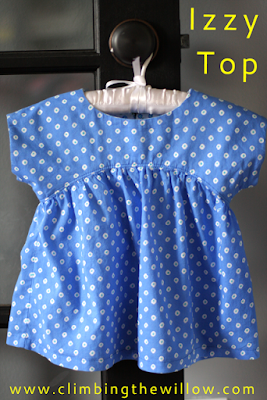 Hey June's Racerback dress (above) could be used to make a nightdress. 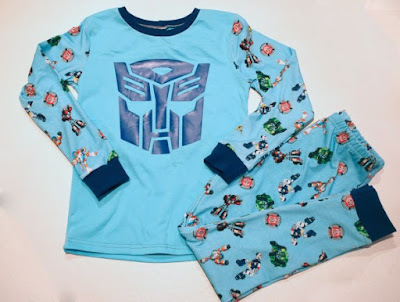 This fantastic basic pyjama pattern is basically a one-stop shop for all your kid's sleepwear needs because it includes heaps of variations: shorts, capri or long length bottoms with elastic or yoga band waistbands, and short, 3/4 or long sleeve versions for the top. 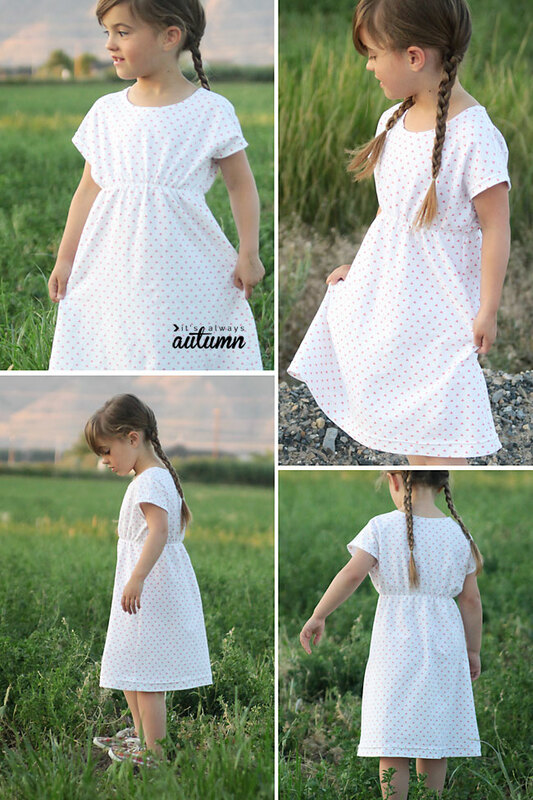 Please note: you must join the Sew a Little Seam Facebook group to access a code that will allow you to download this pattern for free. 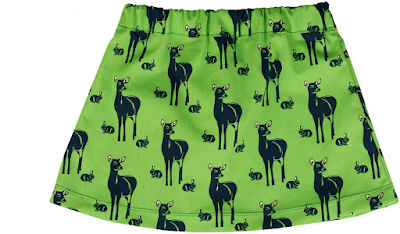 This pattern includes both boxer and brief styles and is for sale, but also available for free when you sign up to their news letter. This pattern might also work as swimwear if made in suitable fabric. An amazing scrap-buster if ever I saw one. 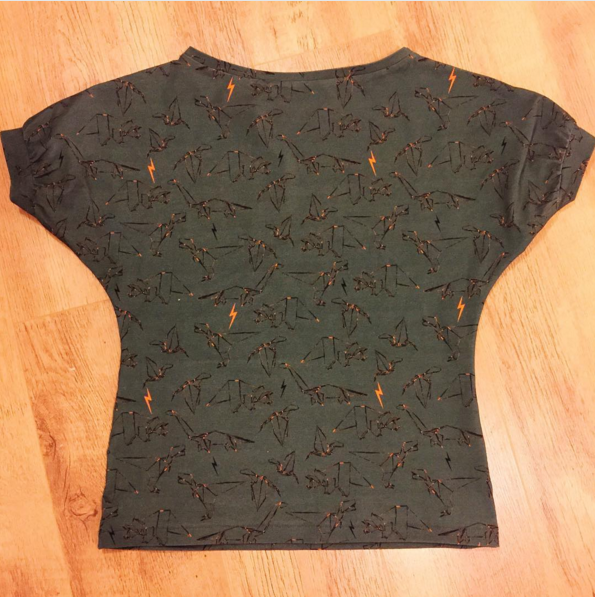 This pattern requires fold over elastic and those small bits of pretty jersey that you weren't sure why you were hanging on to but couldn't bring yourself to chuck out. 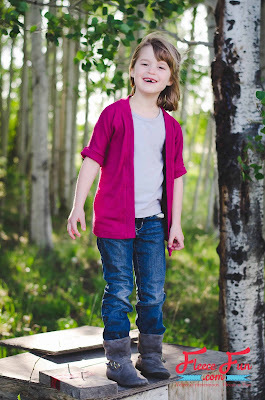 This is like an adorable kid's version of my free women's vest pattern! They recommend to use ribbing for the binding and straps, but I fancy trying it with some soft fold over elastic. This pattern is listed as a 'girls tank' but it looks super unisex (and very cute) to me. It would be a great top for hot weather, or a cosy under layer in chillier months. I was recently given some small pieces of swimwear fabric and I am so excited to give this pattern a try! 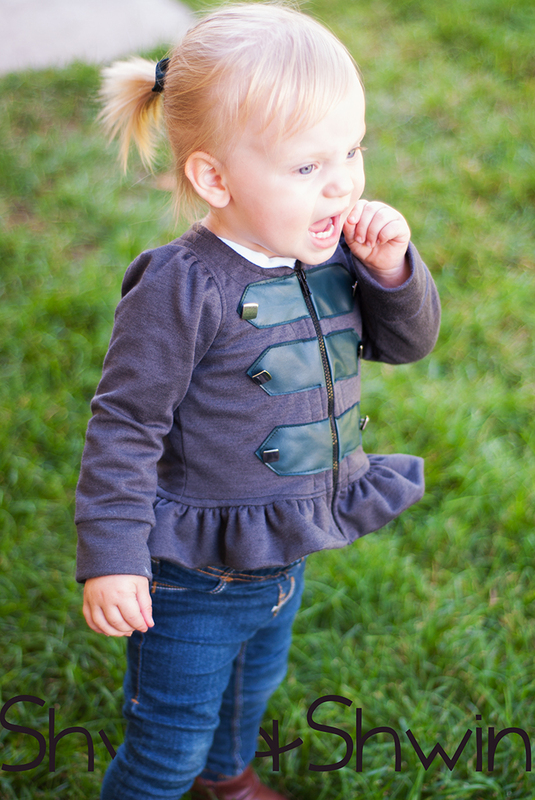 You could also add some ruffles to the front and/or back like Swiss army wife did here. This version was my first whirl at this pattern, but I've made five in total so far and have no intention of stopping any time soon! It's such a fun and satisfying make, and my daughter completely lived in hers last summer. 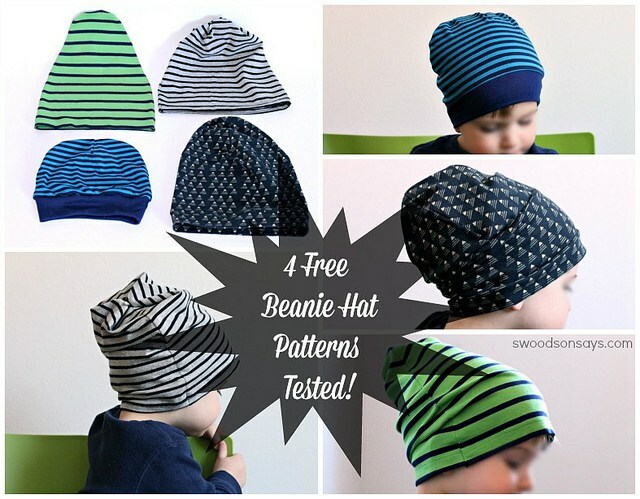 This useful blog post reviews four free beanie hat patterns. I like the look of the grey and black striped one and the blue one, both of which I'm hoping can be made from scraps or old garments. This looks like a slightly more challenging project to create a really special, and hopefully long lasting, backpack. 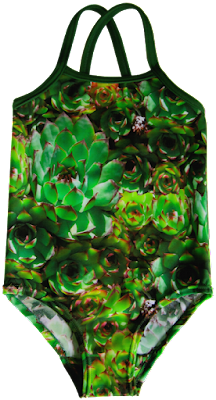 You will need to be a member of Craftsy to access this pattern. It's been yonks since I shared some of the wonderful Dolores batwing pattern creations out there, so if you'll indulge me, let's have a wee update. Fantastic sewing blogger/vlogger Gabby (AKA Gabberdashery) showed us this 70's style poppy print short-sleeved Dolores batwing dress on one of her excellent vlogs, and in turn caused quite a number of her viewers to buy the pattern for themselves. Enormo-thanks to Gabby for spreading her influence in my direction! Oh my goodness! Such a stunning, vibrant long-sleeved Dolores batwing top. How pretty does it look with that little silver necklace?! Damn those effortlessly stylish French women! Having said that, the polar opposite (a hella jazzy print) works awesomely with this pattern too! This fabric makes getting caught out in a storm look really appealing and magical, doesn't it? Umm, there Tina goes again choosing epic fabric to make Dolores batwings from. This one features origami dinosaurs with lightning bolts. I hope you were sitting down when you read that last sentence. Alison chose the perfect bathroom-selfie background to pick out the turquoise in her vibrant floral print Dolores dress! I don't know if she adjusted the fit at all, but this dress looks amazing on her, doesn't it? Clare made herself and her beautiful little girl fabulous matching sparkly garments for a special night out, and they could not look any cuter together! Judging by her Instagram feed, it appears Clare is rivalling Tina Harvey (above), Alexa/Almost a Hippy (below) and myself for most prolific Dolores batwing maker. Now these are some pyjamas I certainly wouldn't be embarrassed to answer the door in! I love the slouchy oversized Dolores top as part of this cosy ensemble. 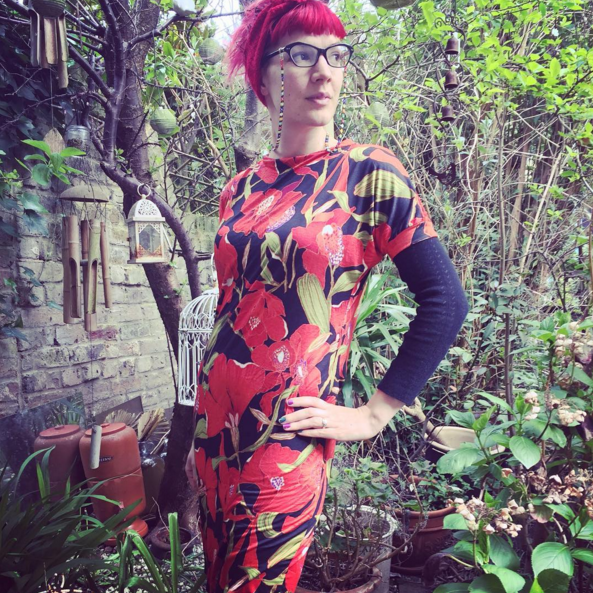 Last September Alexa took part in the OWOP (one week, one pattern) challenge, with the Dolores batwing as her chosen sewing pattern. This peacock-esque printed version is my personal favourite. Thanks to all these lovely ladies pictured above for sharing their Dolores creations. If you have a version of the pattern you'd like to show off, I'd LOVE to see it! Please email me at sozoblog (@) gmail dot com, or via Instagram using the hashtag #doloresbatwing. 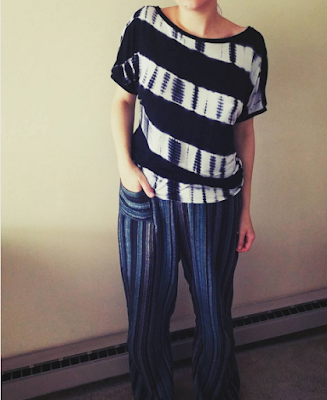 If you wish to see more amazing versions, check out how the Dolores batwing pattern looks in solids, prints and stripes.